Your time should be yours to enjoy. Showering should be a time to relax and refresh yourself. Who wants to think about having to clean and scrub the glass sometime later? With AllClear® you don’t have to! Our advanced AllClear* stay-clean coating technology repels water, limescale, and soap scum so your shower glass virtually cleans itself. The water sheets off the glass, washing away dirt and residue as you shower. A quick wipe is all that’s needed! It’s more hygienic and cleaner and looks a lot nicer without smeared glass and limescale! Uniquely, this time-saving stay-clean coating is standard on both sides of the glass**, on all Lakes products, at no extra cost. Some manufacturers charge over £100 extra as an option for a less effective coating. AllClear is guaranteed to outperform untreated glass for 3 years. *Extensive tests by the Institute for Glass Science and Engineering, New York, proves that AllClear outperforms other coatings in the market. In a side-by-side test you can clearly see the difference between normal glass (right) and glass with our AllClear coating. Inspired by nature, the AllClear coating forms an invisible, microscopically smooth shield to prevent this build up of grime. AllClear’s hydrophobic properties cause water to run off freely, washing away residue and dirt as it goes. It’s an amazing effect which has to be seen to be believed – one reason why we’ve produced a video demonstration so you can see the AllClear magic for yourself. Water and grime cling readily to untreated uneven glass surface. AllClear protective coating repels water and grime to stay looking cleaner for longer. With less dirt and bacteria build-up, there is less need for harsh chemical cleaners, which is kinder to the environment and your pocket. Enjoy your shower, then step out and get on with your life. 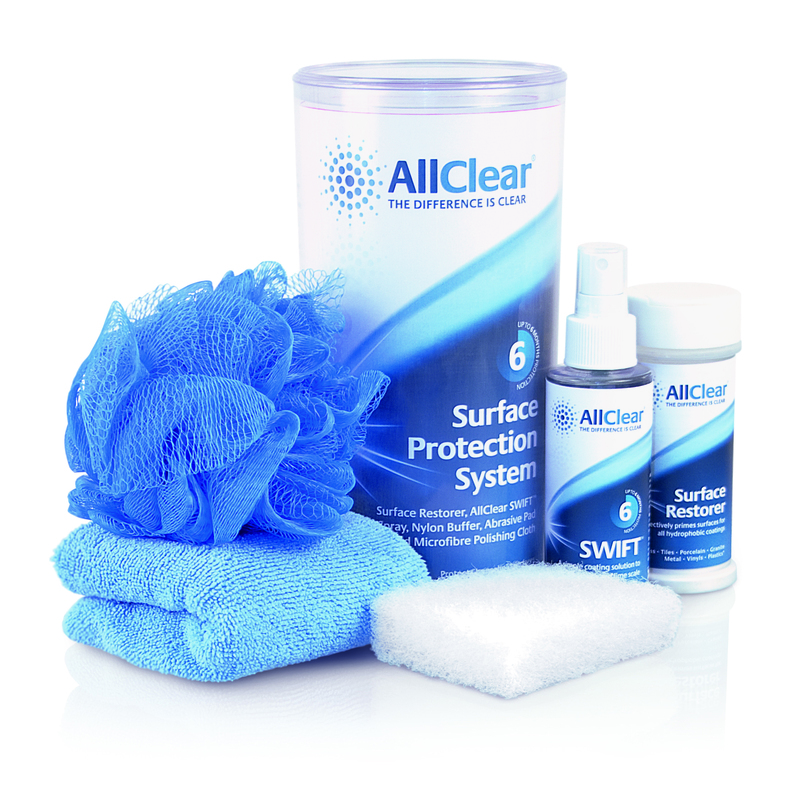 Shop our full range of AllClear products. Order online now.